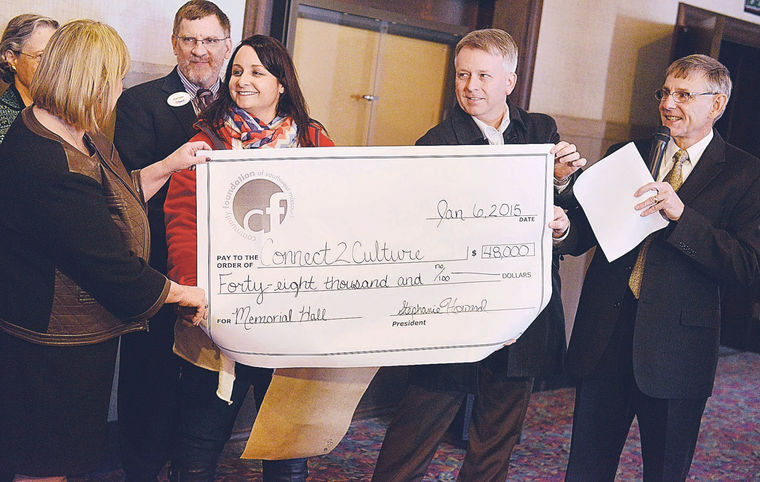 "A consortium of Joplin organizations that want to explore the possibility of remodeling or rebuilding Memorial Hall as a cultural arts center have met their first goal to raise $65,000. That money will pay for initial architectural design plans and other work needed to study the proposal, they announced today. A grant of $48,000 has been awarded toward that goal by the Community Foundation of Southwest Missouri, said foundation spokesman Stephanie Howard in a press conference held in the lobby of Memorial Hall, 212 W. Eighth St.
"Memorial Hall is an integral part of the city and was an integral part of the tornado relief effort," Howard said of the award, which was made from Joplin's Tornado Recovery Fund. "We are so appreciative of the efforts of the foundation and the other donors to reach the $65,000 goal we needed for the project," said Clifford Wert, co-chairman of Connect2Culture. They are working with the George A. Spiva Center for the Arts, Pro Musica, and the Downtown Joplin Alliance to create a public-private partnership that will now study the potential for renovating the hall. Private donors made up the rest of the money needed. Those groups will explore the use of the hall as a possible new gallery for Spiva Arts Center and a 500-seat performance hall for Pro Musica and other community performances. Connect2Culture also is working with the Joplin School District on a cooperative agreement to use the new Joplin High School auditorium as a site for larger performances. The group received the approval of the Joplin City Council only 35 days ago, Wert noted, to conduct the study if it raised the $65,000."